Freshman Olivia Raymond in mid-air competing on the balance beam portion of the Senior Night gymnastics meet against Brigham Young University and Maryland. Participating in its last home meet of the season, gymnastics finished in second place with a score of 195.325 against No. 32 Maryland and No. 19 Brigham Young Friday night for its Senior Day celebration. 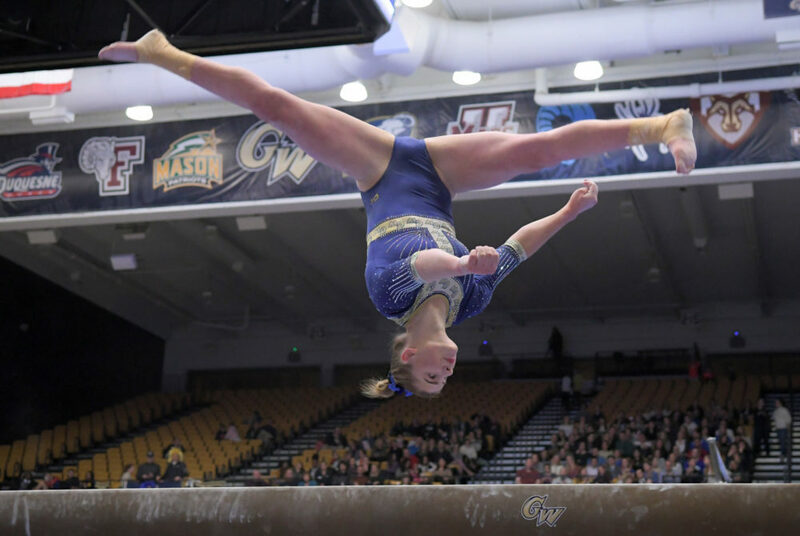 The competition marked GW’s third consecutive meet finishing with at least 195 points. The Colonials put up a season-high score of 49.025 on bars and tallied 48.725 on vault, 48.650 on beam and 48.925 on the floor exercise to garner their second-place finish. BYU finished the competition with an impressive first-place score of 196.500, while Maryland finished in third place with 194.825. Friday’s meet celebrated the last competition at the Smith Center for four student-athletes: senior Yurina Harada, fifth-year student Brooke Bray, senior Julia McLaughlin and fifth-year graduate student Alex Zois. The competition also celebrated the final home meet for manager Lexi Napoli and student coach Remi Roberts. 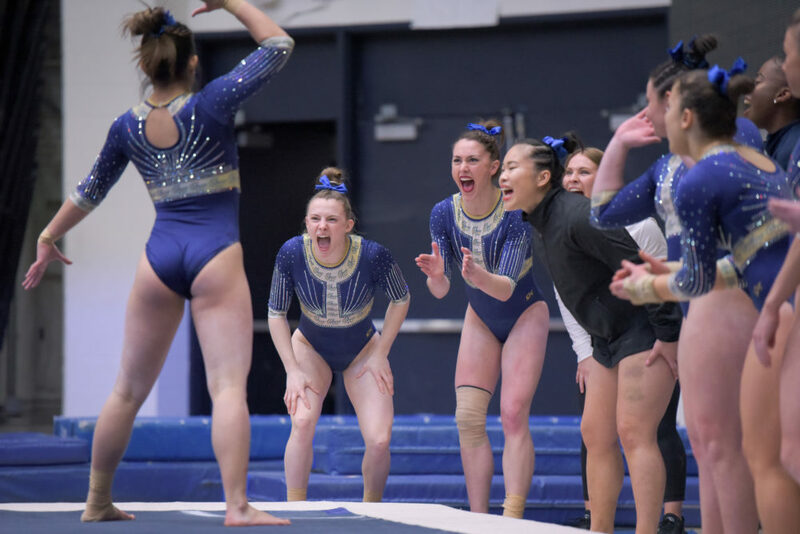 Sophomore Anna Warhol, fifth-year graduate student Alex Zois and other members of the team cheer on senior Yurina Harada during her floor routine. Zois paced the competition with a 9.875 score on the vault and a 9.850 score on the floor, both leading the field. Her all-around score of 39.425 was a career-high and tied for first in the field in her final career home competition. “It was awesome, just knowing that it was my last time that I was ever going to compete here, I just wanted to give it my all and leave it all out on the floor and I think that’s what I did today,” Zois said. Zois also checked in with a second-place finish on the balance beam, notching a score of 9.875. Sophomores Katya Karpova and Hannah Cohen finished in a tie for fourth place on the beam with a score of 9.850. Heading into the floor exercise, their final competition of the night, the Colonials were in second place with a score of 146.400, trailing Brigham Young with 147.250 and sitting just ahead of Maryland with 146.200. Freshman Simone Bannen, who compiled a 9.800 on the floor exercise, placed third on the podium for the event. Earlier in the night, Bannen posted a career-high 9.850 score on bars to lead the Colonials and finish fifth in the event. GW has three regular-season meets remaining this season before the East Atlantic Gymnastics League Championship, all on the road. Two of the three meets will be at Maryland and North Carolina State, which are ranked ahead of the Colonials. The Colonials return to action at 7 p.m. Monday against No. 32 Maryland on the road.